A Tale Of Two Cities (by Charles Dickens) was a weekly serial publication at this time 150 years ago. My tale of two feathers is about dinosaurs and modern birds with a twist on feathers. Welcome a new name, Darwinopterus -- a flying dinosaur -- Darwin's wing. Found in rocks from the Middle Jurassic of China earlier this year, the 20 plus skeletons are about 160 million years old. The newly defined pterosaur (Mesozoic flying reptile) "provides the first insights into a transition between basal, predominantly long-tailed pterosaurs and the more derived, exclusively short-tailed pterodactyloids." Evidence for modular evolution in a long-tailed pterosaur with a pterodactyloid skull was published online this week in the Proceedings of the Royal Society B. "The head and neck evolved first, followed later by the body, tail, wings, and legs," said David M. Unwin, a coauthor.“Frustratingly, these events, which are responsible for much of the variety of life that we see all around us, are only rarely recorded by fossils. Darwin was acutely aware of this, as he noted in the Origin of species, and hoped that one day fossils would help to fill these gaps. Darwinopterus is a small but important step in that direction." Thomas Henry Huxley had proposed a close relationship between birds and dinosaurs. Enter, Anchiornis huxleyi, named in honor of him from a genus of small, feathered, troodontid dinosaur Anchiornis. A pre-Archaeopteryx troodontid theropod from China with long feathers on the metatarsus by Dongyu Hu et al., published a fortnight ago in Nature, reports on an "exceptionally well-preserved small theropod specimen collected from the earliest Late Jurassic Tiaojishan Formation of western Liaoning, China." An abundance of feathering in the 155 million-year-old fossil shows the complexities of "skeletal and integumentary features close to the dinosaur–bird transition." The authors conclude: "This new find refutes the temporal paradox." In the same issue of Nature, Lawrence M. Witmer comments on the temporal paradox among other issues in Palaeontology: Feathered dinosaurs in a tangle. How can a descendant arise before an ancestor? "Anchiornis resets," Witmer writes, "that whole debate. By predating Archaeopteryx, Anchiornis shows that bird-like feathered theropods were around early enough to serve as ancestors, although no one is suggesting that Anchiornis itself on the list of theropods with hind wings." 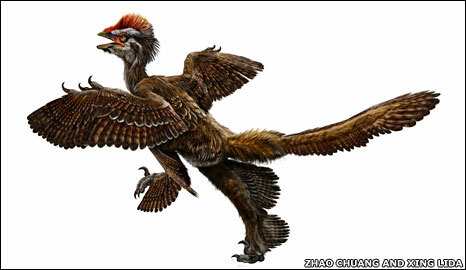 "Birds are dinosaurs," confirms Professor Witmer. "That's hardly the stuff of headlines any more, as data have streamed in revealing anatomical similarities between birds and the theropod dinosaurs from the tips of their noses to the tips of their feathered tails." He concludes: "Basal members of all three of the Paraves groups — Anchiornis, Microraptor, and Pedopenna — had long pennaceous feathers on their lower legs and feet, as well as on their hands and tail.The implication is that avian evolution conceivably went through a 'four-wing' stage." Archaeopteryx, ancient feather or wing, entered the scene first in 1860 as a single feather, from some 5 million to 10 million years younger Jurassic rocks in Germany. The next year, which is two years after Origin of species, a complete specimen was found and sold to the British Museum. The next one, uncovered in 1877, is the Berlin specimen. 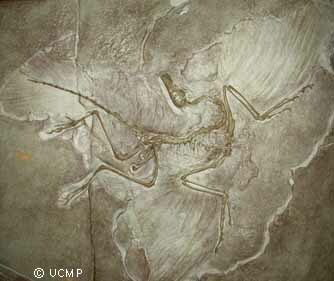 Since then six more have been found of Archaeopteryx with reptile-like teeth and bird-like feathered tail. A recent study by Gregory M. Erickson et al. of the Archaeopteryx long bones was published last week in PLoS ONE. Their research answered the question, Was Dinosaurian Physiology Inherited by Birds? "The first birds were simply feathered dinosaurs with respect to growth and energetic physiology." The authors dispute that non-avialan dinosaur growth and physiology were inherited in totality by the first birds. Furthermore, these animals experienced exponential growth rates like non-avialan dinosaurs, three times slower than living precocial birds, but still within the lowermost range for all endothermic vertebrates. (a) Observe striped fossil feather and recent woodpecker feather. (b) There is evidence of vivid iridescent colors in feather fossils more than 40 million years old. Thus, the oldest flying reptile, Darwinopterus, is 5 to 10 million years older than the first bird, Archaeopteryx, and shows similarities to both primitive and more advanced pterosaurs. And "birds are dinosaurs," wrote Professor Witmer.